The Scaevola calliptera or Purple Fan is also called the Royal Robe. It is quite a prostrate plant and the leaves are stepped and hairy. We don’t have many and the ones I have found have been on the east face of the forest. 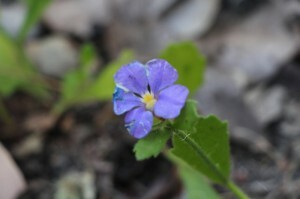 It is in the same family as the Leschenaultia, Goodenia and Dampiera. It got to almost 36 degrees today, so I was more than happy to be walking in the shade of the forest looking for new plants.